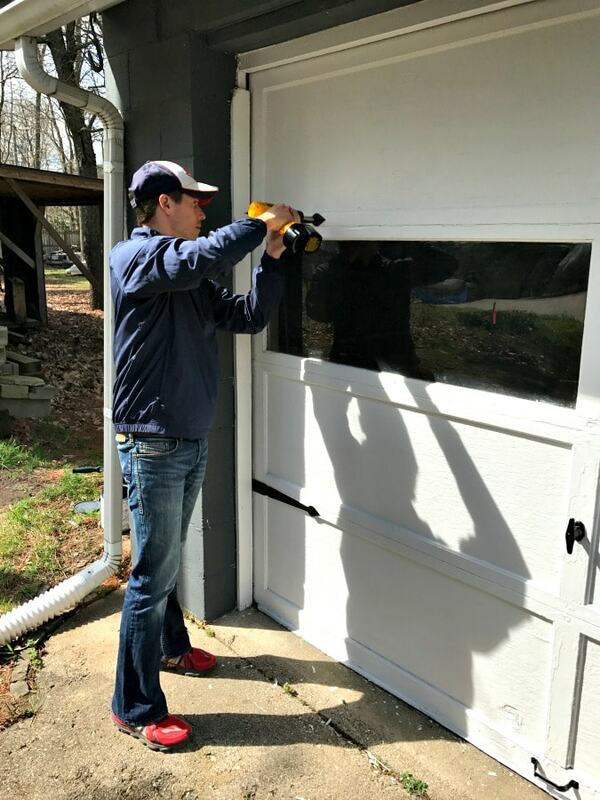 While the inside of our house is still a mess and I never want to see another moving box again in my life, I did manage to snap a few pics of our pool house garage door makeover that I wanted to share with you all. Here’s a closer look, yikes! First up we had the house siding color matched at a local paint store and hit the cinder block with a few coats of paint. 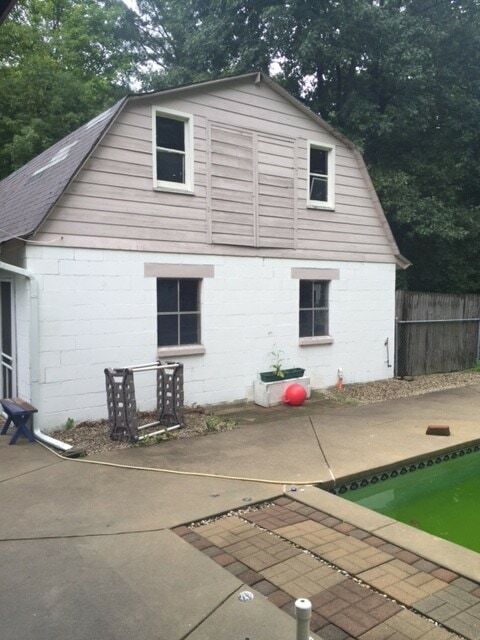 Painting it the darker color really helped hide the look of the old cinder block. We also caulked all the cracks. 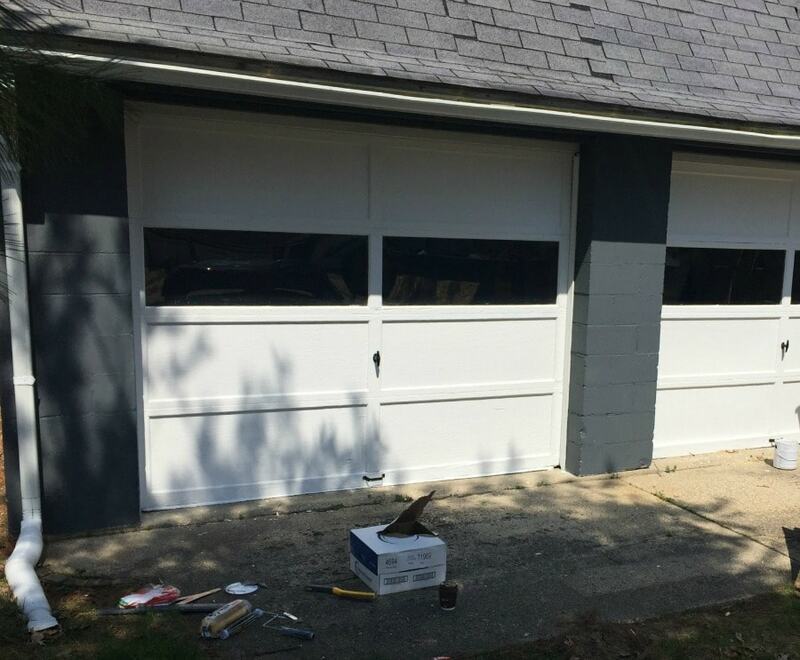 The garage doors themselves also got a fresh coat of paint (after lots of scraping). This garage was built in 1957 (according to the carving in the cement), so it was definitely in need of a face lift. National Hardware provided me with this great gate hardware I found on their site. The Mr. helped me add it to the doors. It was super easy to install, and came with all the screws and hardware we needed. I love how such a small, easy to add detail, brought so much charm! 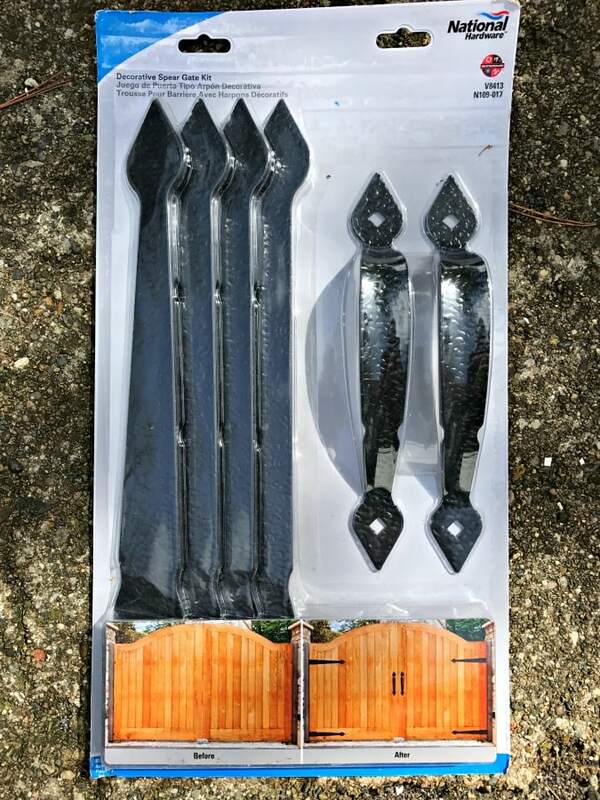 You can find your own National Hardware gate kit here, it would also look great on a fence gate like they show above. I wanted to make the doors feel even more cottagey or more like a carriage house versus a run down old barn. So, I picked up some inexpensive 1 inch lattice pieces and cut them to the right size with a simple miter box and saw. I attached them in a grid pattern with liquid nails that’s specifically for glass applications. I just used a little painters tape to hold them up while the glue dried. Tada! From scary falling down barn to charming carriage house in one weekend! It doesn’t even look like the same place. I’ve even had a few neighbors ask me if we got new doors! I should mention we also had the roof replaced as it was basically falling in. Oh, I also used the handles that came with the hardware kit on our barn doors on the other side of the pool house. 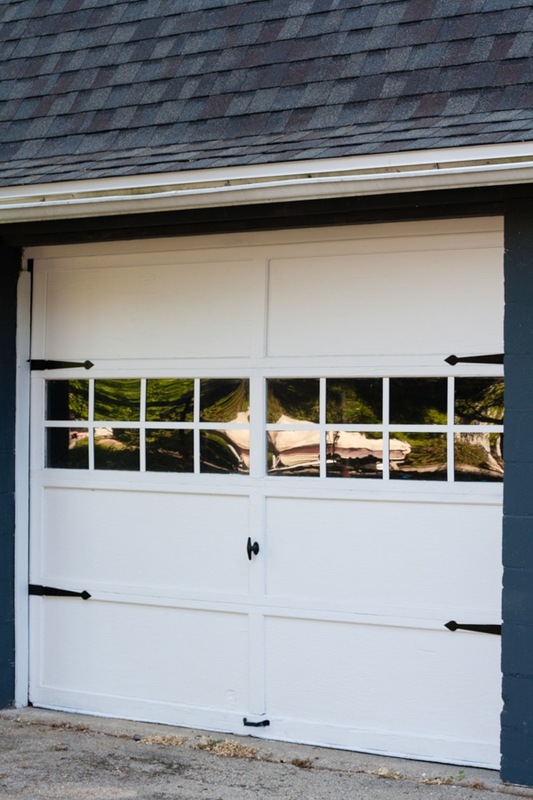 I wasn’t able to add them on the actual garage because of the locking mechanism on our door. I gave the lock a quick coat of black spray paint instead. We still have a ways to go on this space, eventually adding a driveway and some more landscaping. For now I’m so happy we were able to makeover this space into an outdoor area our family can enjoy all summer long. You can find more great products from National Hardware here. They also have lots of great barn door kits as well so be sure to check them out! Wow! What a facelift! Great job! Thanks Dori and so easy! Looks fabulous. Love the exterior colour shown, looks very chic. 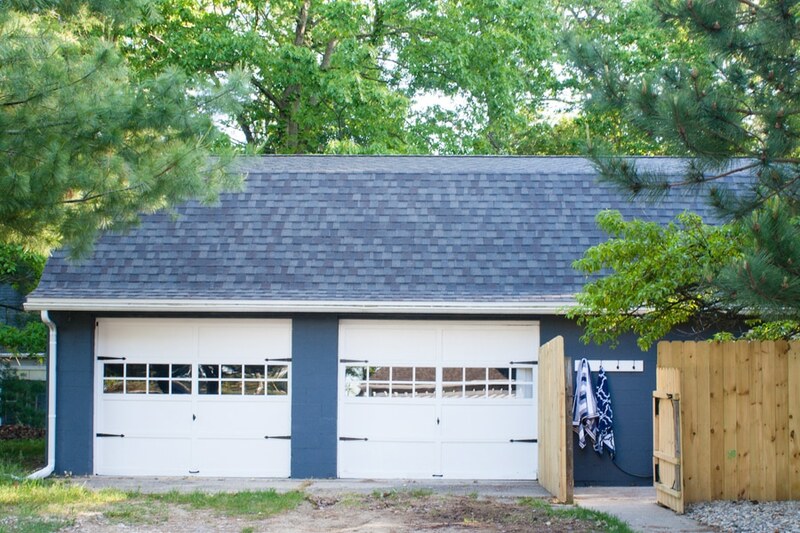 Thanks Bernadette, the darker siding color really makes this area pop. Looks fantastic!! Can’t believe what some elbow grease and coats of paint can do!! 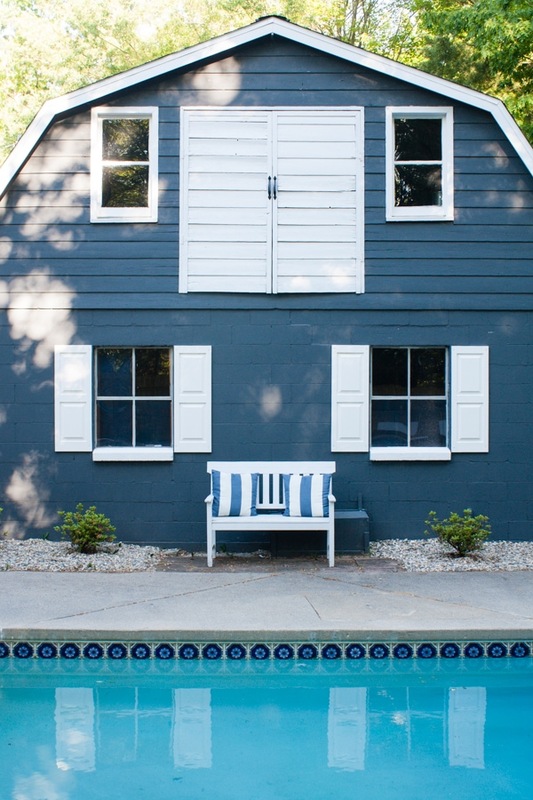 The color you picked out it ideal for the pool house. It is coming together so well. Thanks Marisa, the power of paint is amazing! Such a simple project but big impact. Can you give me some more information about the roof shingles that you chose? All of it is fantabulous! The paint, the brackets, the bench, everything! I love how you’re aren’t afraid of color. Seriously, everything looks great! 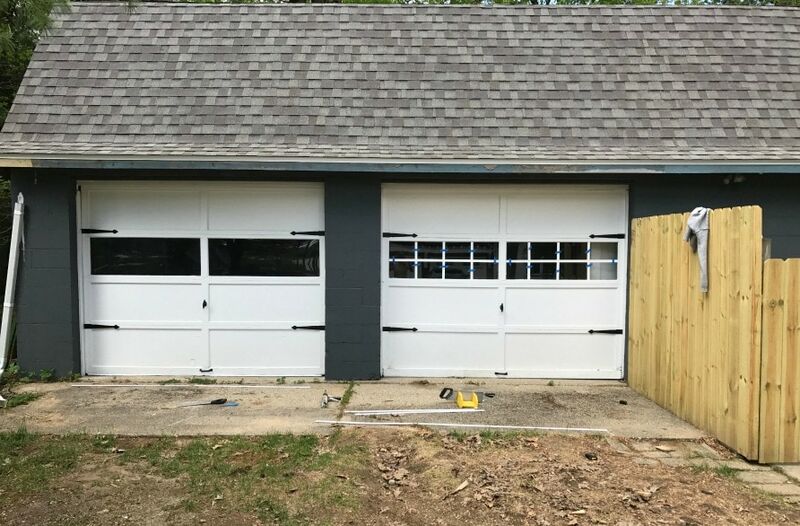 I love the garage doors and how the entire project turned out. Great job. Easy updates, but they make a big difference! Looks great! Hard to believe it’s the same garage. You did a fantastic job! Great work! 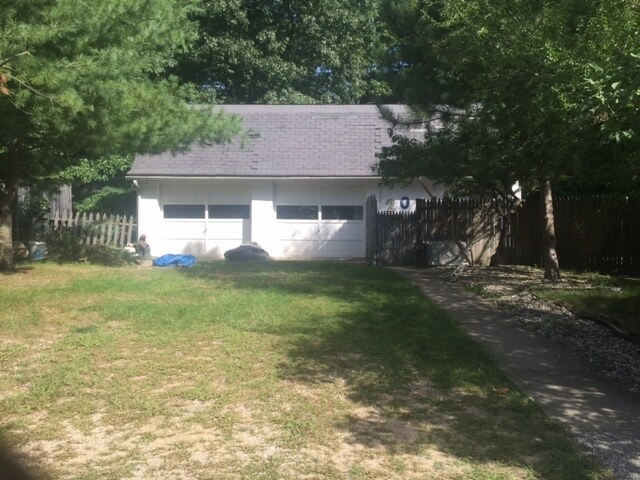 What is the paint color on garage? The hardware does look good, but the real genius is that you added grids to the windows and picked a great color for that cinderblock. I love that color. It looks amazing. I would have never guessed those were the same doors! Wow, it looks like a brand new building! Great job!!!! Such a transformation!! Really looks great!! What a difference paint and hardware makes! Looks terrific! Thank you Donna, such an easy fix! Thanks Jenny, can’t believe those little details transformed this space so much! Nice work! Things are coming together so nicely!! WOW! I cant beleive those are the same windows! What did you clean the glass with to make them shine like that? Love the grid idea, really makes it look Lakey. Oh I have a suggestion, You know Better than I do, I love the bench you added , I think what would be so cute is on the wall above the bench , a real Life Saver Circle thing that you throw out for people drowning would be perfect. Im kinda addicted to CIRCLES. to me they are so Coastal feeling. Just an idea. You are the PRO! LOVE LOVE LOVE all youre doing! Oh that’s a fun idea, I actually have a few that I haven’t done anything with – thanks for the tip! Love it. 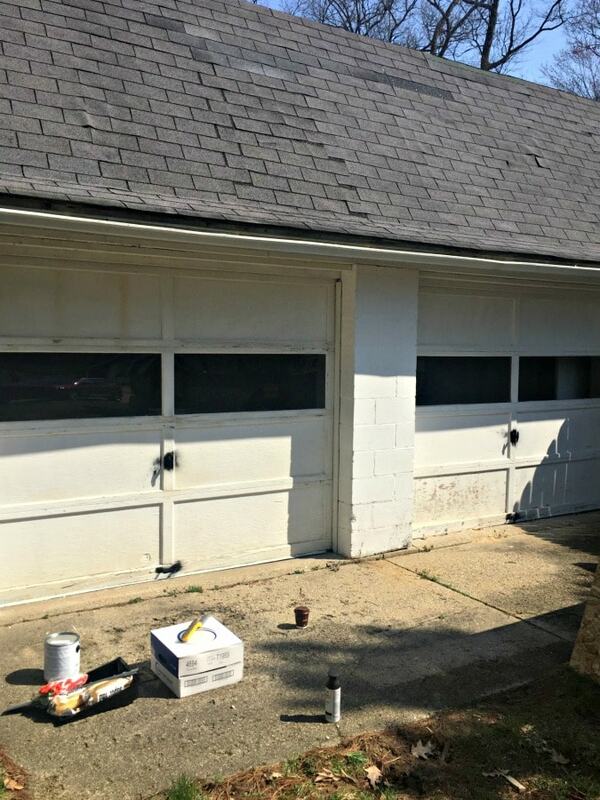 I want to paint our garage doors but I’m afraid of it. I’m a big DIY gal but I fear I will paint the panels to each other! Any suggestions? Hey Mychele I didn’t have any issues with that and I definitely didn’t do anything special but it was an old old door so not sure if that mattered? Good luck! 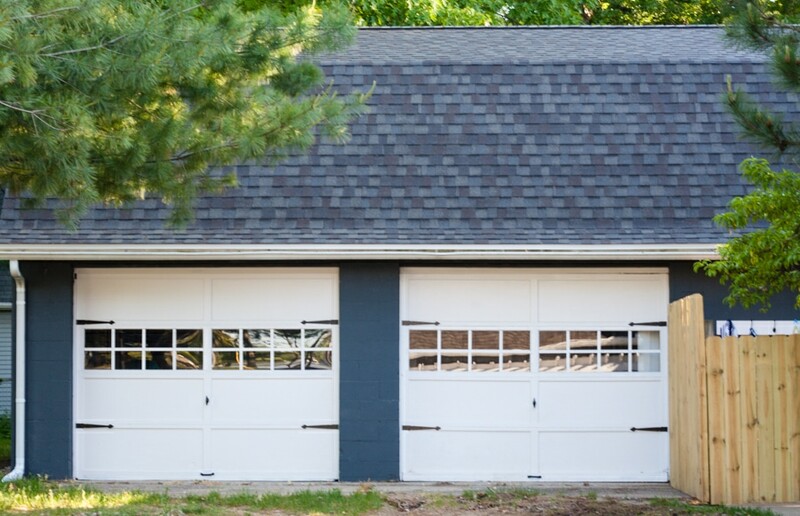 Great job on your garage door! It looks worlds better. I think the additional hardware on it really makes it pop. It’s really a dramatic change. Also, I love the dark blue paint you used on your home and barn. Keep up the good work. Your home looks marvelous.